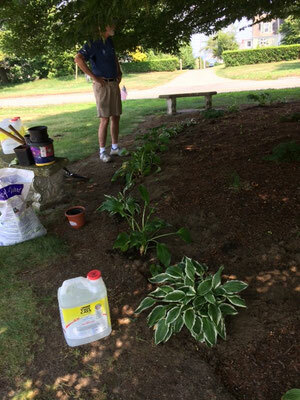 Activities: Civic Beautification - portsmouthgardenclubs jimdo page! 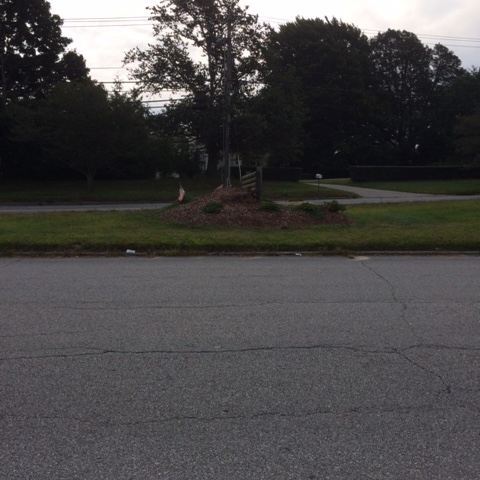 The Portsmouth Garden Club has completed a refurbish and replanting of Legion Park begun two year ago. 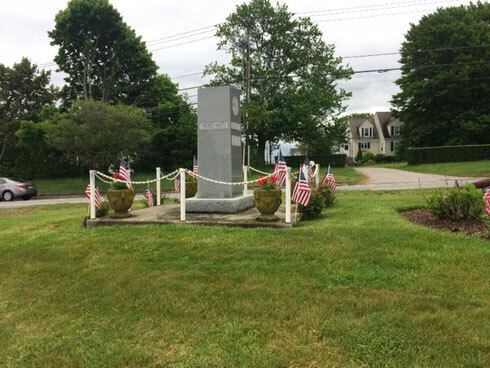 The Portsmouth Town Hall overlooks a triangular park of land which was set aside after World War II, as a memorial to our fallen soldiers. 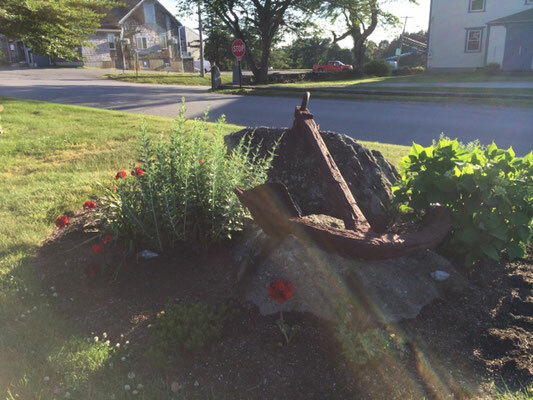 Originally laid out by the American Legion Post with an anchor from an old British frigate and cedar trees, in June 1948 the Portsmouth Garden Club obtained permission from the town council to develop that garden plot more fully. 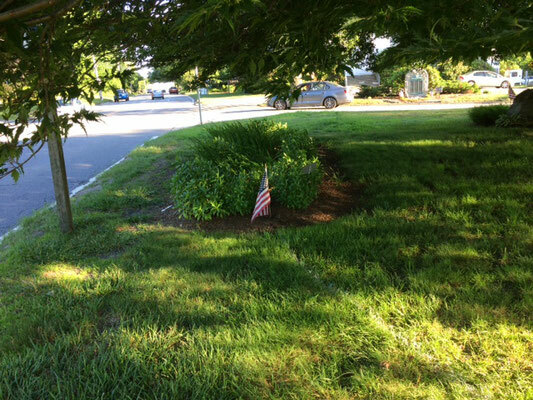 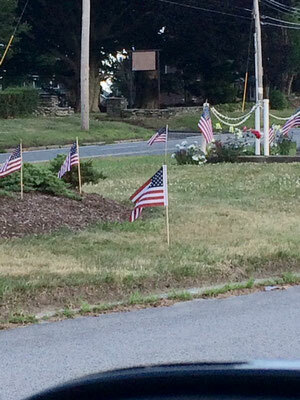 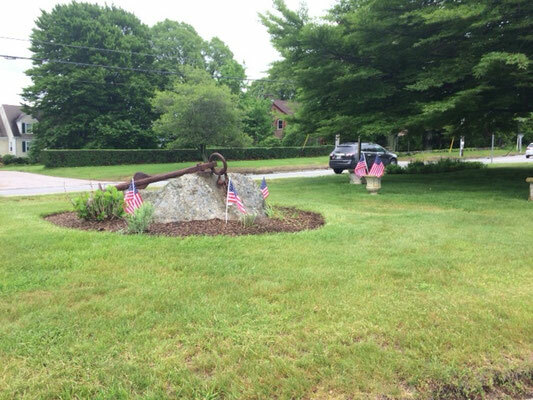 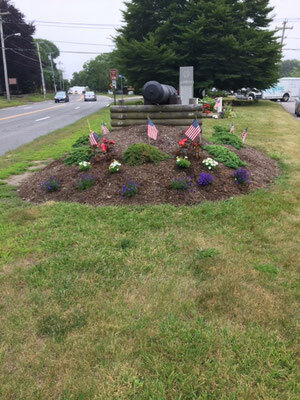 Since that time the club has added and expanded flower beds, added a Liberty tree, helped the historical society place a cannon at the front, decorated for Christmas and placed flags on appropriate Veteran’s days. 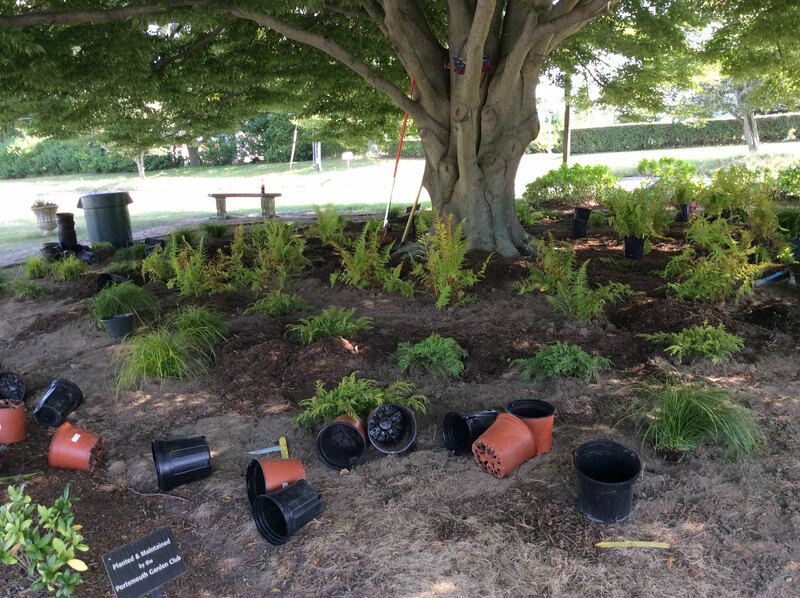 Shade, overhanging branches, a decaying cannon carrier, tired looking plants and poor soil created recent issues beyond merely planting and watering the flowers. 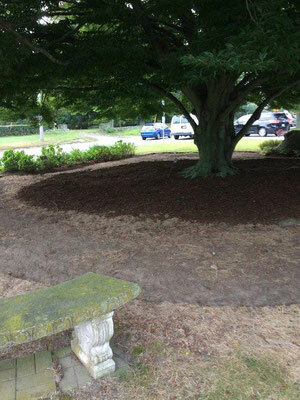 With grants over the two years from the Aquidneck Land Trust, a legislative grant via Senator James Seveney, funds from the R.I. Federation of Garden clubs and our local Portsmouth club’s civic beautifications funds the work was done to beautify and identify the park. 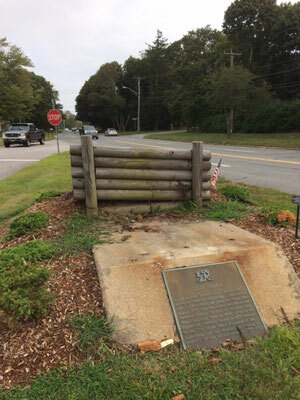 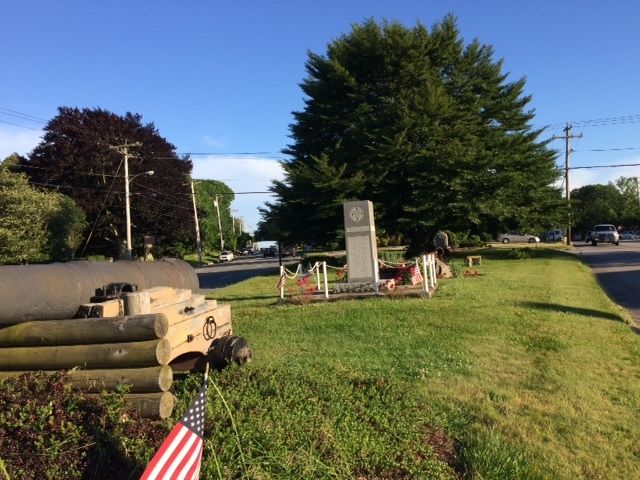 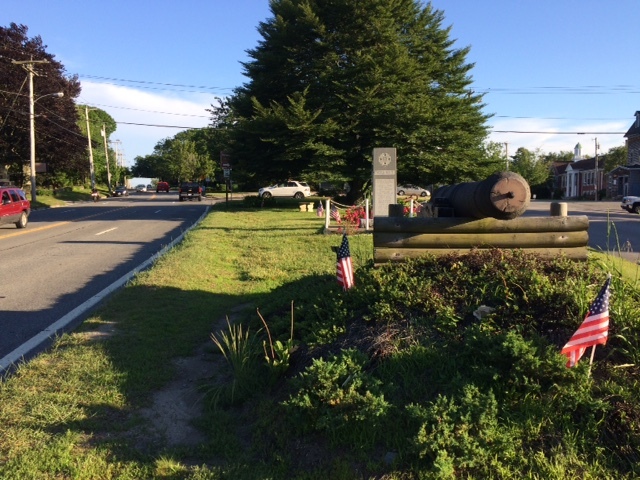 First the cannon was repainted and the carrier rebuilt by volunteer, Manuel Sousa , the Liberty tree was trimmed and reshaped to allowed better sight of town hall and the road, the soil under the tree was amended, some beds closed and a very large round bed planted with blue flowers and ferns. 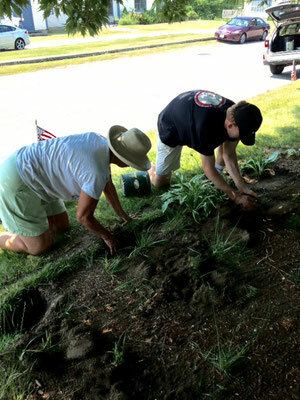 Then the beds around the obelisk were expanded and red roses and daylilies planted, augmented with colorful annual flowers. The bed around the cannon was refurbished with more cedar plans than had be planted to celebrate the club’s 75the anniversary nearly 15 years ago. 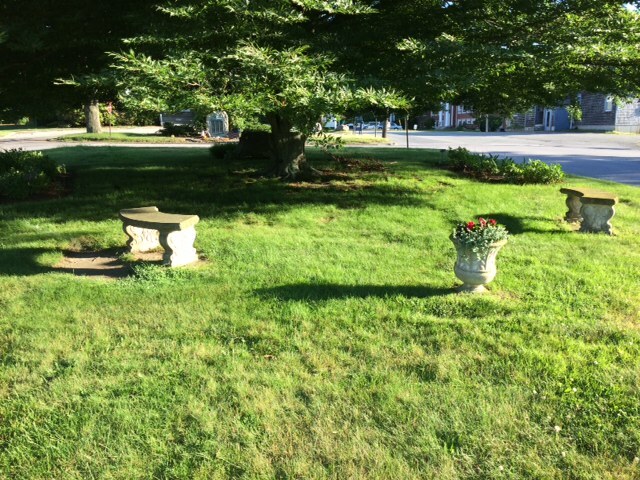 Red impatients were also added there. 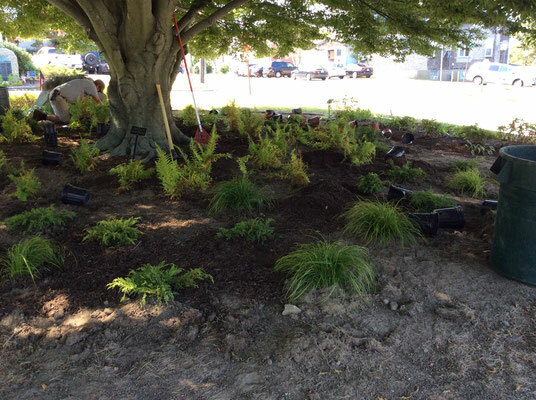 This fall nearly over 50 donated and purchased hostas were planted framing the circle under the tree and numbers ground cover plants were planted closer to the trunk. The hope is that in the spring a the display will be attractive. 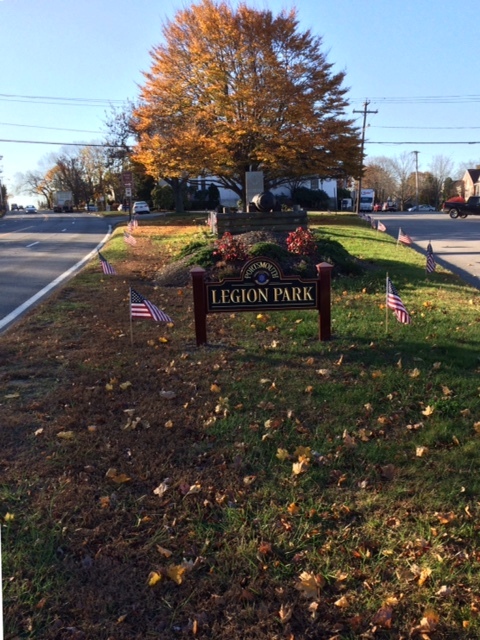 Lastly the club requested permission of the council to place a club conceived, designed and fully paid for sign naming the triangle LEGION PARK. 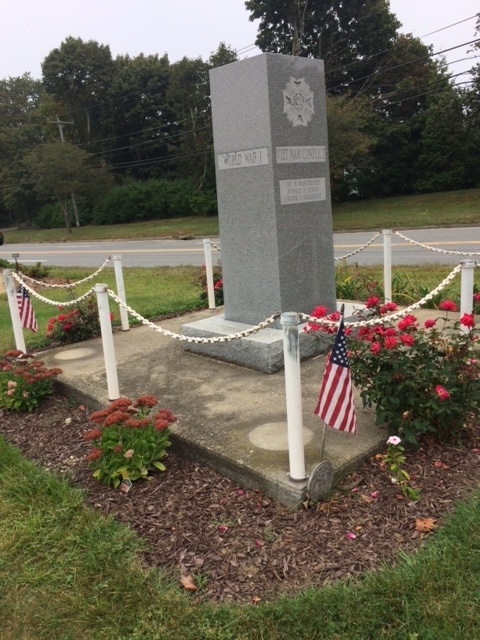 That was placed last week in time this Veterans Day, the 100th anniversary of the armistice of WWI. 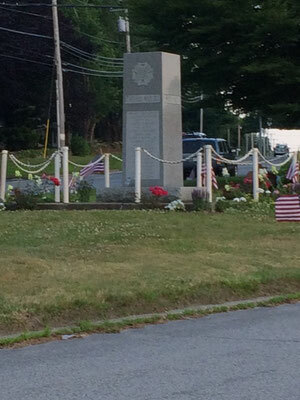 Roberta Stevens, present President and Marilyn Brockway past President would like to thank the town administrator and town council for their encouragement, Brian Woodhead of the Public Works Department, all the financial sponsors, Island Garden Shop and Liptak Design on behalf of the club members for their contributions. 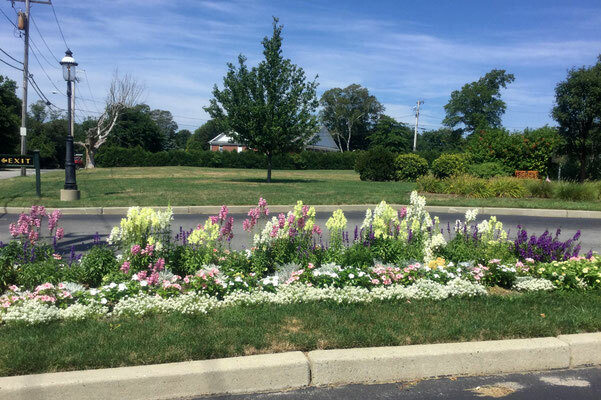 Instrumental in volunteering with the hard work of planting are the current term civic beautification chair people Carrol Goetzinger, Mary Di Bara and Brenda Sisson. 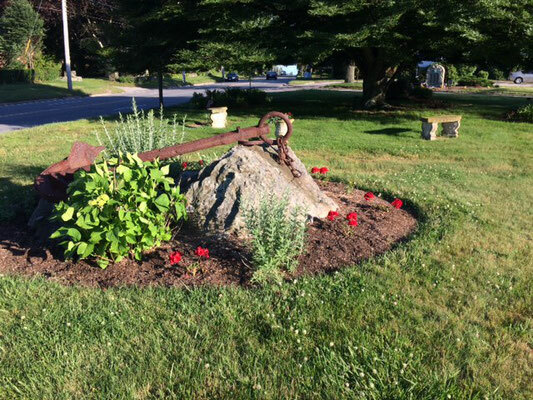 The club will celebrate it’s 85 anniversary year next year and continues to work on civic beautification and other community goals. New members wishing to join are encouraged to send a note to view or website, https://www.portsmouthgardenclub.com/, mail to P.O. Box 826 or call our membership chairperson, Eileen. 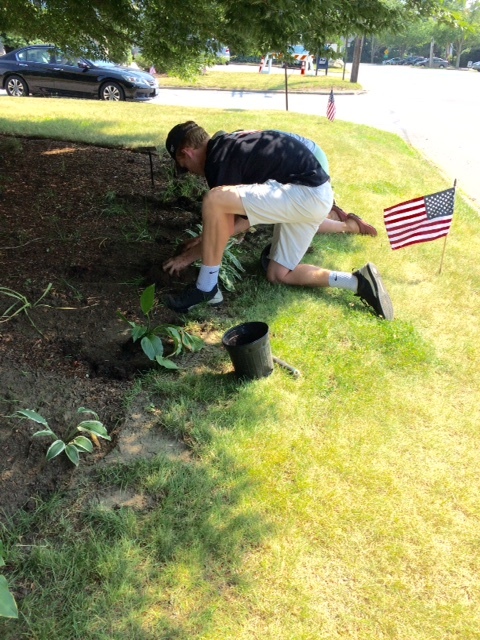 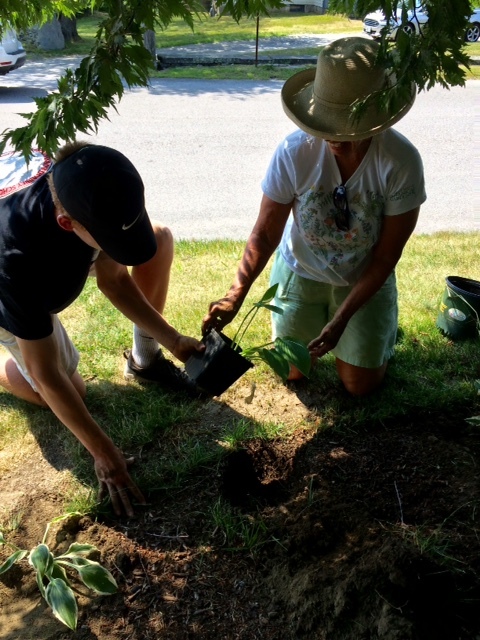 Planting hostas under the tree at Legion Park. 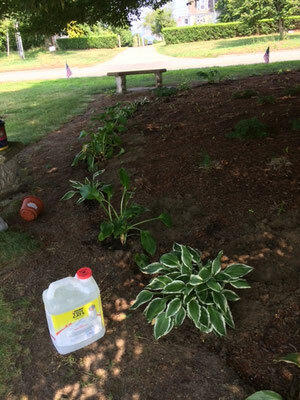 We receive a donation of a variety of 18 hostas from Brenda's garden and 4 from Bobbie's garden. 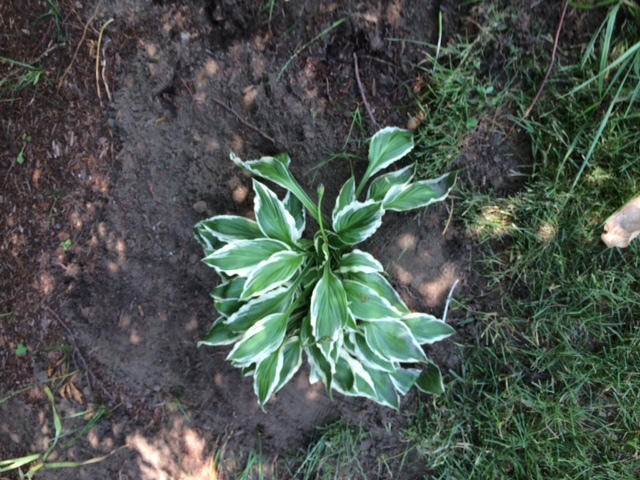 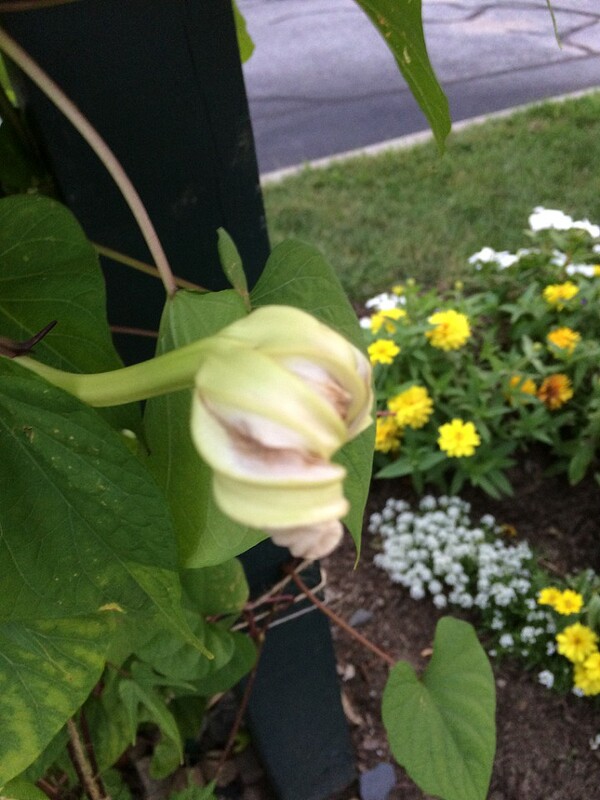 They were planted on July 3 by Brenda, Rich, Bobbie and Shane. The complimented the flags for the fourth and the annuals and perennials the other club members had planted and watered earlier in the week. What do 1,500 bulbs look like? A sea of blue. 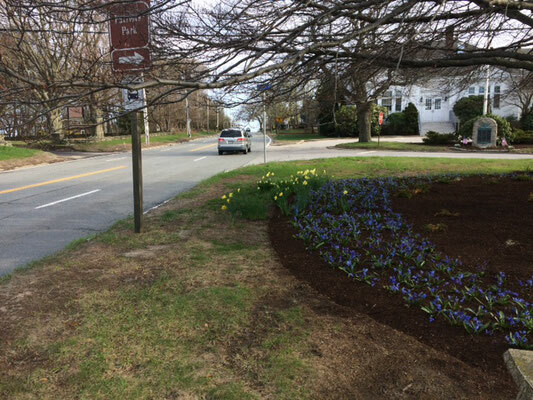 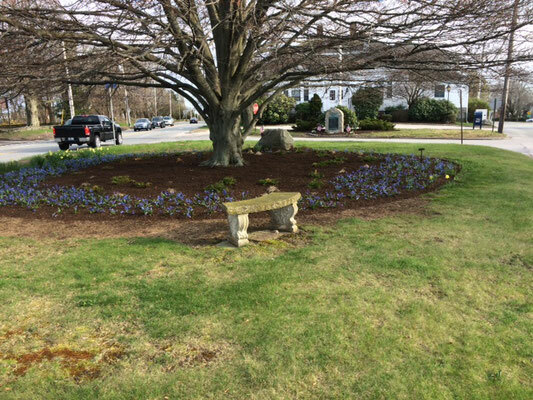 The Portsmouth Garden Club planted 1, 500 Scilla Siberica" Spring Beauty" bulbs last spring and they are blooming at Legion Park in a sea of blue. 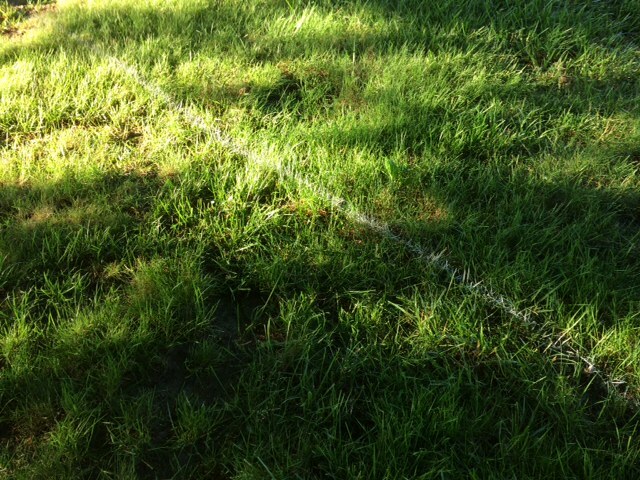 The area needed a new plan so the circle was enlarged; some beds that were too shady were closed. Hostas, ferns and other deep shade loving leafy plants were additionally planted. 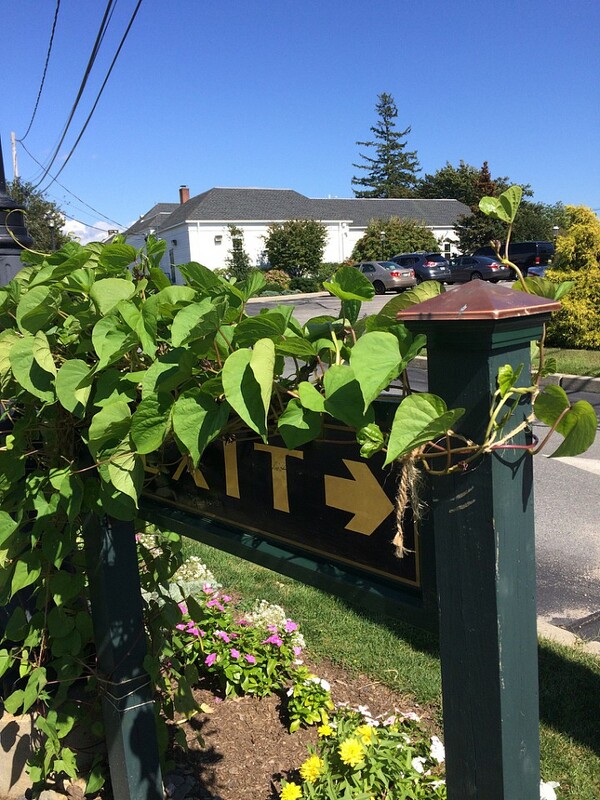 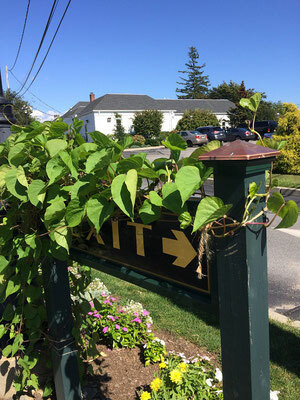 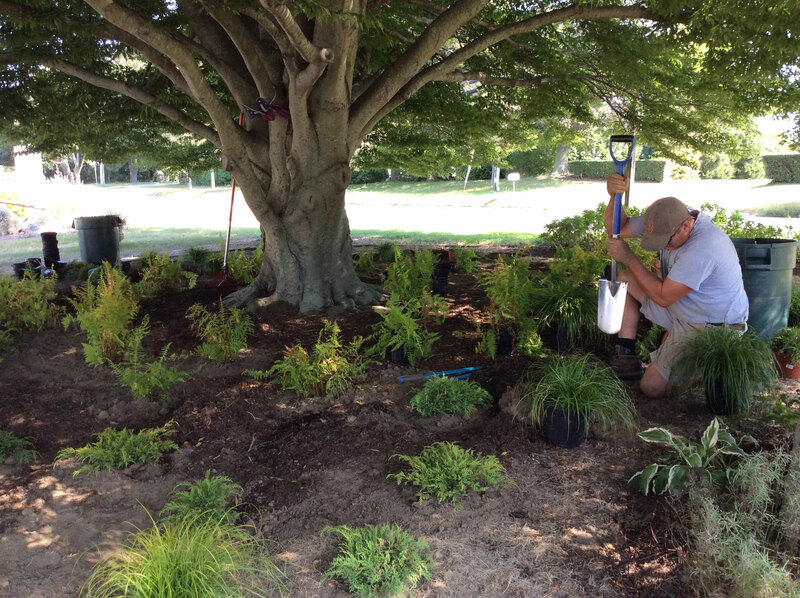 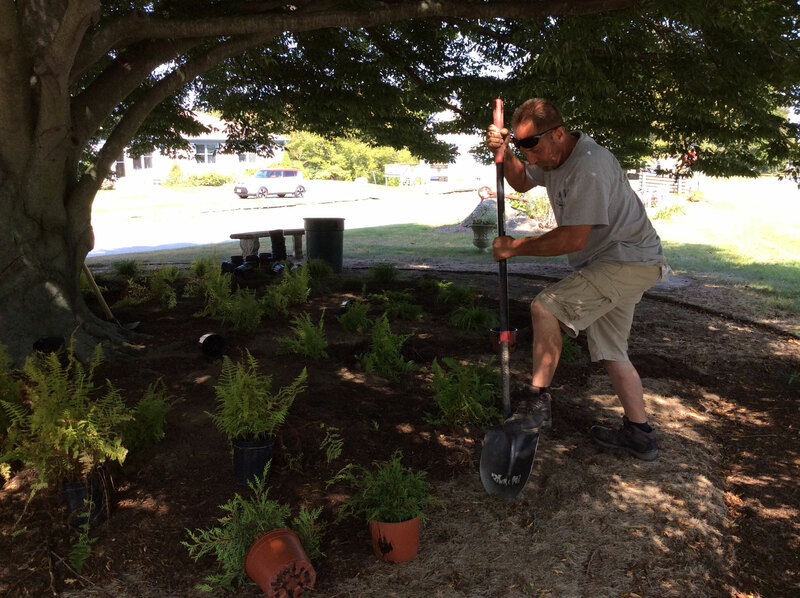 The re-design is not completed yet but the club would like to thank- Senator James Seveney for a Legislative grant, Aquidneck Land Trust and our own club’s Civic beautification fundraising efforts at the Island Garden Shop plant sales.